Well, he certainly bears no resemblance to Eric Clapton. It’s a very nice portrait and my first impression was not a jail but how I thought the background helped him stand out. But we know I don’t have a very active imagination. Several years ago we had a visit from a Glossy Ibis which isn’t a common occurrence in my neck of the woods. It fed in much the same manner as your White Ibis while wading in a damp meadow, picking out little morsels from the grass. I didn’t realize Clapton was part of the Yardbirds until many decades later, so that association never came to mind. The background did help the ibis stand out, but when I took the photo I didn’t realize just how helpful it was going to be. It’s another example of the “Oh, look at that!” response I often experience when I put a photo on the computer. It always amuses me to see actively feeding ibis. When they pause, it’s easy to see just how far down into the ground they’re having to go to find a treat because of the dirt on their bill. It’s especially clear in this photo. Obviously, no young ibis ever is told to wash his bill before he eats. Yes, we all have those aha moments later while processing. Usually it’s a beer can or something undesirable but in other cases jail bars. Oh, and I forgot to mention that the Yardbirds gave us Jeff Beck and Jimmy Page also. Not a bad incubator for guitarists. There are many different species of Ibis it seems. Australia is home to its own native Ibis. A much loved or despised bird. They have taken to large cities and invade suburban parklands and are often seen snatching packet of chips from the unsuspected picnickers. They are great thieves. They are protected and so they should. Their own wet-land habitats are being increasingly encroached upon by cotton farmers keen to use their water, hence the migration of the resourceful Ibis into the cities. I’m surprised to hear that your ibis have adapted to human food. I’ve never known one to do so, but apparently it’s more of a problem in places like Florida. It may be that so much natural habitat still is available in Texas that human/ibis encounters are less frequent, and hand-feeding doesn’t take place. In my immediate area, the conflict over water is more obvious between rice farmers and urban areas. Oddly, it’s been hard to find large flocks of birds in the usual places over the past year or two. We’ve had so much rain that there has been water standing everywhere, and the birds have been more scattered because of it. Every now and then, one of these jewels of nature will devour a snake from our yard – I love when they’re around!! Of course you’re happy GP. I remember how much you like snakes! I didn’t realize ibis would feed on those, but I knew they would take frogs and crabs, so they’re clearly willing and able to take on larger prey. It seems that in this stage of your life yardbirds are playing a greater role than yardarms. That’s true — but I’d much rather hang out with yard birds than hang from a yardarm. That’s a memorable portrait. 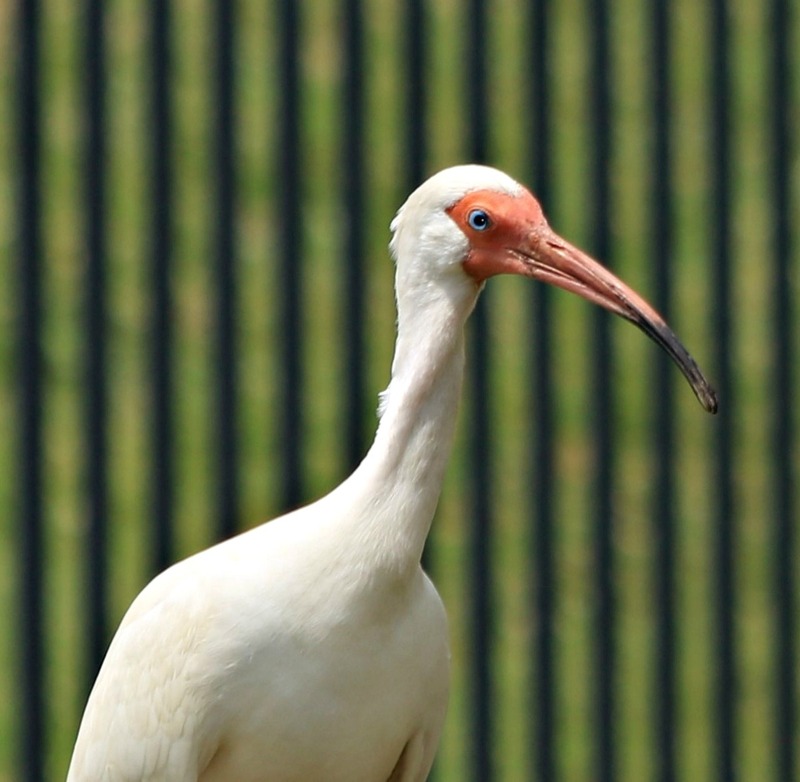 Ibis does look apprehended, but not apprehensive – – it actually looks pretty happy about whatever it’s snacking on. And I haven’t listened to the Yardbirds for ages, good reminder to play them tonight. I was glad I had my telephoto lens on the camera. That let me stay far enough away that Mr. Ibis didn’t feel threatened. I suspect if I’d gotten out of the car, he would have flown. It’s amazing how effective a car can be as a mobile bird blind. The Yardbirds were a great group, although I think I prefer Cream — partly because their versions of some of the blues classics are interesting. But it’s all great music, and worth a little wander down memory lane. In Florida they are frequent visitors of yards. Flocks of them will move through non-wetland areas. A few years ago, there was a flock that hung out across the street from my place, working the expansive lawn at the nursing home/assisted living facility. There were about thirty of them, juveniles as well as adults, and they were great fun to watch. I got a few photos, and I’m glad I did, because they’ve moved on to greener pastures. I haven’t seen them there since. You were lucky to have your camera with you and it posed for a great shot. Sometimes, a quick, candid shot can be as interesting as something far more posed and intentional. Most of the images weren’t worth keeping — the backgrounds were too busy, or the bird was out of focus, but I thought this one hit the mark. Great capture, Linda! It almost looks like you Photoshopped the background (and a fine choice, too, because it’s sedate enough to put the focus on this big bird). When I saw it, I thought of the kind of funky wallpaper that was common in the 50s and 60s — but it does make a fine background for the bird. There’s no way I could have photoshopped it, so I’m glad I was able to photograph it. Aren’t they fun? They always remind me of a kid with chocolate pudding on its face. You know how far they’re having to dig for their treats by how much of their bill is dirty. Thoth, the ibis-headed god was thought by the ancient Egyptians to have given them writing. Of course, I thought of The Yardbirds, that group which once contained the guitar heroes Jimmy Page and Jeff Beck. (Of course, we all know what Jimmy Page gave us!). Let’s see. Jimmy Page, Jimmy Page… that wouldn’t be Led Zepplin you’re thinking of, now would it? I confess to being more a fan of Beck, and Albert Lee for that matter, but who would want to make a forced choice with that crew? Of course you realize you just sent me down a bit of a musical rabbit hole, but with my taxes done and the kitchen cleaned up — why not? What a lucky capture. Just goes to show you should always carry a camera (or have one in your car). You just never know when an interesting subject or scene will pop up. I rather like the background in the shot. Makes the ibis really stand out, whereas sometimes foliage, trees (or whatever) can be distracting. You’re exactly right about the problem of a distracting background. That’s why, of all the photos I took, only this one survived the cut. Between the kids, and the cars, and the dog-walkers, most just weren’t satisfactory. I was pleased that this one was — and isn’t it interesting that the pattern actually adds more interest than a plain background would? THAT is a fabulous shot! What a lucky thing that he/she dined at your place AND you had your camera. He’s a handsome chap–love his blue eyes. The great irony is that I was headed down to the Brazoria refuge to see if I could find — some birds! I don’t like taking my camera to work with me because of certain issues with keeping it safe while at hand, but I noticed today that the green herons are back, and there are starlings, doves, grackles and mockingbirds with nests scattered around. There’s certainly no lack of subject matter..
Aren’t those eyes pretty? During mating season, their lores become more colorful, and it looks like this one might have somewhat deeper color. Very nice portrait, and the corduroy background is quite pleasant and not distracting from the star of the show. What a perfect description — corduroy. That’s it, exactly. It is an interesting background: not as boring as a plain color, but not distracting, either, thanks to the regularity of the pattern. I couldn’t have planned it if I’d tried. Someday I will see an ibis in person. And I’d love to see one as you did — just sort of there, a surprise appearance! He’s beautiful, your yardbird!